Hundreds of militant fighters against capitalism and all its horrible consequences for the world got together here at the 56th National Conference of Workers World Party on Nov. 7-8, and the result was a small earthquake. The venue itself said so much. The conference filled the main hall at the Malcolm X and Betty Shabazz Memorial and Educational Center on the edge of Harlem — with its stirring murals of these courageous leaders of the African-American struggle for self-determination. It was in this very building that Malcolm X was brutally gunned down in 1965, after achieving worldwide fame. It has been rebuilt into a beautiful and hopeful place. The preponderance of people of color, women and Queer people, both in the audience and speaking at the WWP conference — plus what they had to say — was yet another vindication of Malcolm’s belief in the rising of oppressed peoples, by any means necessary. So was the presence of a large delegation of Boston school bus drivers, mostly Black and immigrant, whose union fights on a wide variety of progressive causes. The conference theme was audacious: “Putting Socialist Revolution on the Table.” The word “socialism” is getting around these days, finally. But the WWP message was not of the fuzzy kind. What came through in every speech and every piece of literature was that the national liberation struggles of Black and Brown people in the United States, especially since the rise of the militant Black Lives Matter movement and that of low-wage workers, must be and are an integral part of the class struggle to completely transform society by getting rid of capitalism and building socialism. Young people, like the large number attending the conference, have caught onto this very fast. They said through speeches, poetry and song that they don’t want to live in a world where people are humiliated and impoverished because of their nationality, immigration status, sexuality or gender expression. Socialism isn’t just reforming capitalism into something “kinder and gentler,” said many speakers. That’s impossible. The toll this system takes every day on millions and millions of people here and around the world can only be ended when the rule of the bankers and corporate billionaires is broken up through the determined and revolutionary actions of the workers and oppressed. Wow! No mincing of words here. Especially moving were Dionne Smith Downs, a mother from Stockton, Calif., who told about how the criminal police had killed her beautiful 16-year-old Black son, and Erica Mines-Simmons, a community activist from Philadelphia who rocked the hall as she led hard-hitting call-and-response chants born out of the Black Lives Matter movement. After so many heartfelt speeches that laid out the deep suffering in working-class communities, all that pain and anger fused into a collective shout of jubilation when it was announced that WWP would run a revolutionary election campaign in 2016 and that its candidates would be Monica Moorehead and Lamont Lilly: a Black woman for president, a Black man for vice president. It was Teresa Gutierrez, a dynamic Latina leader and now the WWP election campaign manager, who explained why it was most fitting to run two African-American candidates at this time, and how they would do an excellent job of bringing support for the migrants’ struggle and other issues to a broad audience. The feeling in the hall was unmistakable: A mutual confidence and understanding had been forged between this multinational party — in which Black, Brown and white working-class revolutionaries of all ages, genders and sexualities work and learn together — and outstanding activists in the movements for long-overdue social change. 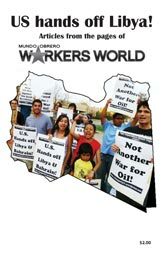 While rightly focused on the developing movements against national oppression here at home, and with many trade union militants also discussing strategies for fighting the bosses, the agenda also elevated the anti-imperialist, anti-war struggle and supported countries facing threats and sanctions, imposed because they either try to build socialism or just try to keep imperialism from destroying their political and economic sovereignty.